This is a white paper by one of our Interaction Design and Information Architecture masters students, Vicky Kulikowski (@Victoria_Kuli). It’s a great review of the literature for those who are professionally designing applications for children as well as a nice evaluation of children’s apps using existing frameworks. Research in interaction, game, and instructional design addresses designing with and for children. While much has been written on leading participatory design groups with children, less has been written on how to design developmentally appropriate apps for preschoolers. One of the biggest skills young children are tasked with is learning to read. However, there is relatively little written on applying design guidelines to early literacy applications. For children ages 3–6, success in early literacy is a predictor of a child’s success in school (Neuman & Roskos, 2005). Through the development of language (speaking, reading, writing), the executive function portion of the brain is activated and critical thinking skills practiced. In the age of technology, the amount of screen time appropriate for young children is hotly debated. Zero to Three, a non-profit organization devoted to upholding developmentally appropriate standards for the education of young children, suggests that it is the context and content of screen experiences that determine the effect screen time will have (Lerner & Barr, 2014). While context is defined as how well parents are involved in their child’s screen time, content is left to designers who may not be aware of the process of cognitive development in early childhood nor how it affects early literacy. Without a clear framework, reading apps enter the market with little educational research to ground them. 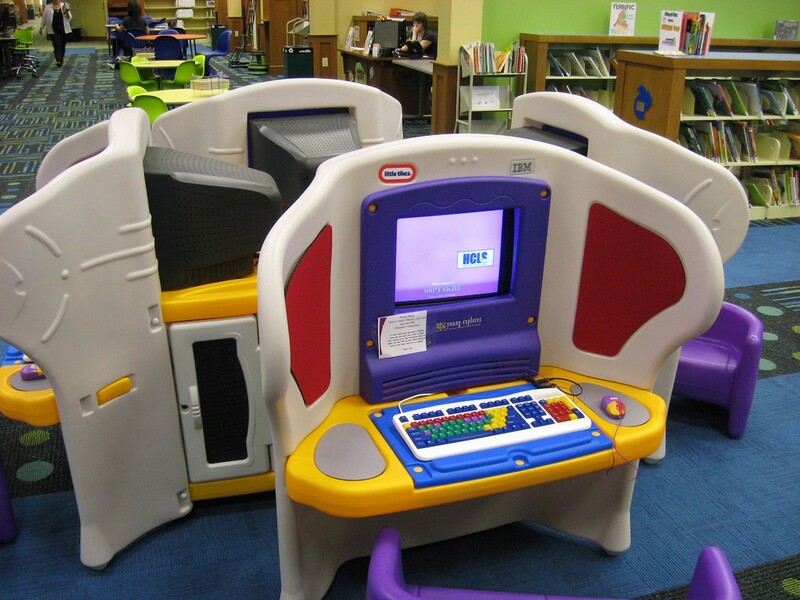 Haugland and Wright (1997) suggest that computers are uniquely well-positioned to offer positive experiences to young children. Computers are not only interactive, social, and holistic environments, but also provide motivation and scaffolding for children’s lessons and intake of information (Gelderblom & Kotze, 2009). This creates a challenge for designers to make applications that follow and enhance early literacy development so that young children are exposed to age-appropriate content, context, and structure. This paper will include a summary of the developmental stages of reading, an overview of existing design guidelines and frameworks, a review of novel approaches to early childhood interaction design, a comparison of current preschool language apps, and suggest next steps in early literacy app design. When early childhood educators talk about children and literacy the discussion revolves around the interplay among reading, writing, and speaking. All skills develop at once along a continuum and not a “rigid sequence” of steps (Neuman & Roskos, 2005). Organizations like NAEYC and training programs like FirstYears at the University of South Carolina, Chapel Hill offer parents downloadable PDFs which outline the milestones in literacy development. The preschool years are full of rapid development for young children, including the onset of expressive vocabulary, writing scribbles, and recognition of sequence and narrative. Some designers recognize a need for a unique framework when creating interactive content for young children. For instance, in Designing Games for Children the author notes that a child’s preschool years usher in a newfound sense of self which changes how children relate to one another (Fisher, 2014). Around age 3, preschoolers no longer play games in parallel with their peers, but rather engage each other socially in shared tasks and games. The author’s suggestions for designing for preschoolers hinge on including a social aspect so that children can explore their newly found sense of others and practice working alongside peers. Along with the sociability of group work, young children learn by activity: doing, making, creating, and experimenting. Alternative educational philosophies, like Montessori and Waldorf, encourage teachers to teach through activity: a constructionist approach to learning. This directly challenges mainstream instructionist philosophies where children are told what to do in place of allowing children to learn through exploration and play. The authors of “Speechblocks: A Constructionist Early Literacy App” found that this approach is under- represented in the children’s market (Sysoev, Hershman, Fine, Traweek, & Roy, 2017). The authors argue as Seymour Papert (1993) in Mindstorms does, that “the key learning affordance of computers (which smartphones essentially are) is not to program the child through tasks and answers, but instead to be a tool for exploration and expression through the construction of artifacts” (p. 248). As Papert points out, shared cultural forms are useful in the design of interactive experiences for young children. A few studies have explored how common artifacts can be used to make interactive experiences more accessible and understandable. One study on early literacy development concludes that because “cultural forms are inherently linked to social practices,” a child and parent have shared knowledge on rituals surrounding reading aloud together (Horn, 2013, p. 628). The author suggests that designers can use this to create an interactive experience that mimics and then expands upon the shared ritual. Considering that children ages birth-23 months watch 55 minutes of screen time a day and preschoolers watch an average of 90 minutes a day, designers need guidelines to address young children’s developmental needs (Lerner & Barr, 2014). Some researchers have taken up this challenge. Some of Revelle and Reardon’s suggestions stem from design theory. For instance, the use of large hotspots is based on Fitt’s Law which states the user will have more success and speed in completion of a task if the area is large enough to manipulate. However, Revelle and Reardon offer another guideline that suggests the avoidance of hotspots near the edge of the screen. This guideline contradicts Fitt’s Law yet is appropriate for young children who do not have well developed fine motor-control. The authors observed that without fine control of their hands and fingers, young children grasp handheld devices awkwardly, often with their fingers curling over the edge of the device and onto the screen. The study showed this led the children to unintentionally activate hotspots located near the edges of the device. Debra Levin Gelman offers designers developmentally appropriate frameworks in her book Design for Kids: Digital Products for Playing and Learning (2014). However, they are a blend of practical suggestions such as make functions consistent across the game vs. opinions like do not design for gender preferences (p. 45). Expanding on the idea of designing with developmental considerations in mind, Gelderblom and Kotze’s (2009) guidelines follow the observation that “skill is task-specific, context-specific and dependent on factors such as emotion, memory, culture, experience, and biological maturation” (p. 54). They suggest that designers create instances in apps where independent skills are practiced but also repeat these skills in the larger context of the game. They note that skill mastery in one domain does not necessarily transfer to another so by repeating the skill the game counters against this learning restraint. In addition, the authors suggest promoting reflective thinking about the skill being practiced. In this way, the child becomes aware of the processes underlying success and failure in a task: a lesson which can then be transferred more readily to other domains. Learning a new skill can be easier if the new skill comes packaged in social and cultural artifacts that children and families are familiar with. In “Textural Tinkerability,” the authors observed storybook sharing behavior between parent and child (Chang, Breazeal, Faridi, Roberts, Davenport, Lieberman, & Montfort, 2012). They suggest a set of guidelines based on the shared reading habits they saw which are culturally grounded and based on an artifact: the book. In their literacy prototype, the authors mimicked the most common interactions they observed between parent and child. The app offered interactive components where they could act out verbs, show temporal and spatial adverbs, and affect the narrative arc in order to exemplify more abstract concepts of character emotion and motive. The app encourages critical thinking as well as social learning. The Next Generation Preschool Math project led one group of designers to suggest similar guidelines as the Sesame Street designers with a few additions. The authors suggest designers allow for multiple opportunities to allow children to learn throughout the game as well as pace the game (Presser, Vahey, & Zanchi, 2013). Surprisingly the idea of pacing a game was mentioned only in this article. In educational philosophy and teaching instruction it’s a contentious issue. As faster load times and larger bandwidth allow for fast-paced, high action animations, educators question how the super-sonic pace is affecting early childhood learning: a time of great brain growth. Zero to Three found that exposure to fast-paced programming negatively affected executive functioning in an observational study of 4-year-olds and screen time (Lerner & Barr, 2014). This has a number of implications in future design strategy for young children. As executive function is responsible for planning, control, memory, and delay of gratification, designers have a responsibility to encourage its development and not detract. Executive functioning is called into use when a child must interpret instructions. While textual instructions are usually practical, young children cannot read. Imagery, audio, and movement are some of the areas researchers have explored to communicate instructions. In a study by Kahkonen and Ovaska (2006), the authors observed alternative ways to communicate instructions to young children. They conclude that in order to begin a screen-based game, children need visual clues at the very start. The visual clues can be backed up by textual instructions which offer a secondary entry point to the game. They also noted that apps for young children should support controls for animation stop and start. If instructions are being given through a short animation, usability issues include allowing for a child to go back and re-watch the sequence of steps. After observing user groups, the authors concluded that none of the prompts was effective for children under three. They also found that visual modification was not understandable even by older children. Demonstrations that mimic modeling behaviors performed by parents and teachers to instruct young children, were seen as most effective. They suggest further studies on which aspects of human-to-human modeling can be transferred to screen. Moving away from the largely visual experience of design found within the constraints of screen applications, other researchers are exploring sensory ways for young children to interact with apps. Noting that previous research shows haptic feedback helps students retain information, Yannier, Israr, Lehman, and Klatzy (2015) explored how the sense of touch can be connected to an early literacy experience. The authors created a haptic learning sleeve that was programmed to mimic the feel of elements within a story. For instance, when users read about rain falling in heavy drops, they could feel the pitter-patter of raindrops on their arm through the haptic sleeve. At the end of the study the authors found that students using the haptic sleeve scored higher in story comprehension and exhibited more accurate recall of events than those in the control group. Similarly, the authors of “Design Rationale: Opportunities and Recommendations for Tangible Reading Systems for Children” (Fan, Antle, & Cramer, 2016) explored the possibilities for early literacy experiences using a multisensory approach. Their interactive reading program involved changing sensory aspects of color, shape, size, texture, and light. Children engaged in a screen experience that connected to their manipulation of 3D letters used to create words. The interactivity of engaging all of a child’s senses matches how young children learn as well as encourages critical thinking based on the feedback given by interactive elements. Expanding on a multisensory approach, the authors of “Investigating Interaction with Tabletops in Kindergarten Environments,” found the social aspect of peer-to-peer learning increased motivation and usability (Kammer, Dang, Steinhauf, & Groh, 2014). Group interactive experiences tap into the burgeoning social nature of preschool children and allow for collaboration in learning new skills. In addition, the authors noted the tabletop as a device allowed for a more a physical movement-based exploration of tasks. While social opportunities within an interactive experience can help with motivation, other research explores how framing literacy apps within the context of story makes the experience more successful. For instance, the authors of “What Did Spot Hide?” created an interactive agent, an animated stuffed animal that responded to children with dialogue and movement (Tewari & Canny, 2014). The authors sought to mimic human conversation between parent and child, where preschoolers have been found to ask up to 80 questions per hour. Due to the limits of technology, one challenge the authors faced was the variety of open-ended questions asked by preschoolers that could not be programmed for. They suggest that interactive agents hold promise for early literacy development as “question-asking, not surprisingly, goes beyond literacy and is an integral part of children’s cognitive development” (p. 1807). Frameworking technological experiences around a child’s personal story is also important for engagement. Because reading and writing co-evolve in the preschool years, the authors of “Using Computational Manipulatives to Support Story Construction by Early and Emergent Readers,” created an interactive system that encourages children to use language to create meaningful content in the context of their lives (Lamberty & Smolund, 2015). By allowing children to arrange their own stories and read them aloud, the authors suggest children are not only engaging their executive functioning skills but also creating meaning. In being creators the children “engage with reading and writing in a personally meaningful way that allows and encourages them to be more than just consumers” (p. 443). This follows the developmental recommendation to encourage critical thinking through creation, a constructionist approach appropriate for young children’s optimal development. Is the skill level of language presented (in instruction and content) developmentally appropriate to that of a preschooler? Is the amount of fine motor control needed to complete the game matched to that of a preschooler? Are developmentally appropriate ways of learning presented? Do the language activities follow developmentally appropriate ways of teaching early literacy? All the apps fared well in giving young children easily accessible ways to interact with the game through hand movements. Hand movements ranged from the easier tap and drag to more complicated drag/drop and swipe. Montessori Crosswords, Montessori Letter Sounds, and Starfall Learn to Read offered children clear instructions in audio form along with icons and animations to reinforce understanding. Super Why! Phonics Fair only offered auditory instructions while Bob Books did not give a clear set of instructions. If the user did not interact with the game upon opening, an illustration on the screen jiggled to encourage interaction. Only Super Why! Phonics Fair did not give feedback in animation, color change, or sound when a hotspot was activated. Montessori Crosswords led the pack in this category as it gave both animation and audio cues. Super Why! Phonics Fair was the only app with a complicated interface. The opening screen is cluttered which requires a level of visual and cognitive sorting that preschoolers do not yet possess. Both Montessori Crosswords and Montessori Letter Sounds have simple layout and cohesive color schemes that do not detract from the content. In progression of content and systematic presentation of word clusters, Super Why! Phonics Fair fell behind while Montessori Crossword came out as leader with a clear progression of content that can be chosen by the child or a parent/teacher from the settings panel. And only Montessori Crosswords had a personalization element in that children can choose a theme for all activities to center around. Overall, Montessori Crosswords fulfilled both developmentally appropriate visual design for preschoolers as well as supporting early literacy skills. Super Why! Phonics Fair scored as least supportive of developmentally appropriate guidelines for preschoolers’ language development. The proposed guidelines suggested by researchers are helpful especially in creating interfaces for young children’s apps. However, they are a far cry from a framework of principles to guide designers in fulfilling the various developmental needs of young children. 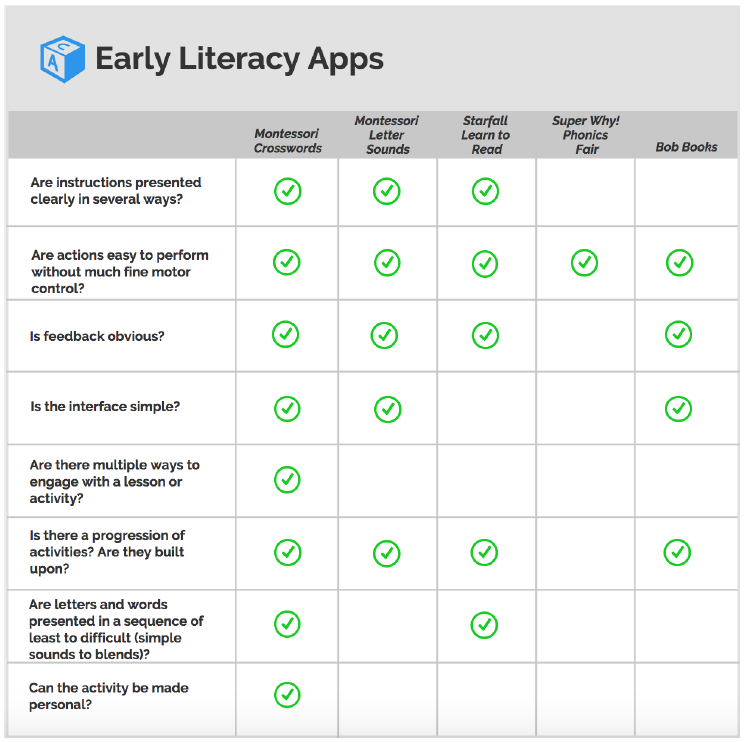 At this time, while interaction, game, and instructional design remain predominantly visually based experiences, is it possible to create a developmentally fulfilling early literacy app for young children? 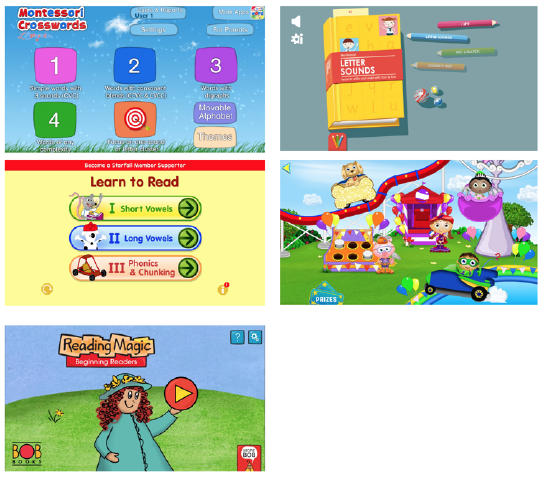 The app comparisons showed that the early literacy games available now are mainly visual with auditory reinforcement. Some researchers are experimenting with interactive 3D elements to take advantage of young children’s sensory learning. With 3D printing costs lowering perhaps integrating objects with screen learning will be easier to test and produce. Until that time designers have to mesh together their own understandings of children’s early literacy development and usability practices. In “Moving Learning Games Forward” by Klopfer, Osterweil, and Salen (2009), the authors suggest a way to categorize games. Clarifying the purpose of an app can help a designer match technological possibilities to developmental appropriateness. The authors categorize types of games as different systems: authoring, content, manipulating, trigger, gateway, reflective, POV, code, documentary, ideological, research, and assessment. Designers can use these categories to match the point of interest of a game to the developmental learning stage of their audience. The type of game and skill of audience can help shape the technology choice. As technological advances allow for more active and inclusive games, including augmented and alternate reality, designers have an opportunity to create unique educational experiences for young children that encourage critical thinking and respond to their developmental needs. Ananian, C., Ball, C., & Stone, M. (2012). Growing up with Nell: a narrative interface for literacy. In Proceedings of the 11th International Conference on Interaction Design and Children (IDC ‘12). ACM, New York, NY, USA, 228–231. Fisher, C. (2014). Designing games for children: developmental, usability, and design considerations for making games for kids. New York: Focal Press. Gelman, D. (2014). Design for Kids: digital products for playing and learning. New York: Rosenfeld Media. Haugland, S., & Wright, J. (1997). Young children and technology: a world of discovery. New York: Allyn & Bacon. Hiniker, A., Sobel, K., Hong, S., Suh, H., Irish, I., Kim, D., & Kientz, J. (2015). Touchscreen prompts for preschoolers: designing developmentally appropriate techniques for teaching young children to perform gestures. In Proceedings of the 14th International Conference on Interaction Design and Children (IDC ‘15). ACM, New York, NY, USA, 109–118. Kähkönen, M. & and Ovaska, S. (2006). Initial observations on children and online instructions. Klopfer, E., Osterweil, S., & Slaen, K. Moving Learning Games Forward. 2009. Cambridge: MIT. Lerner, C. & Barr, R. (2014). Screen sense: setting the record straight. 2014. Neuman, S., & Roskos, K. (2005). Whatever happened to developmentally appropriate practice in early literacy? Beyond the Journal — Young Children. Presser, A., Vahey, P., & Zanchi, C. (2013). Designing early childhood math games: a research- driven approach. In Proceedings of the 12th International Conference on Interaction Design and Children (IDC ‘13). ACM, New York, NY, USA, 376–379. Revelle, G. & Reardon, E. (2009). Designing and testing mobile interfaces for children. Saffer, D. (2007). Designing for interaction: creating innovative interactions and devices. Tewari, A. & Canny, J. (2014). What did spot hide? : a question-answering game for preschool children. In Proceedings of the SIGCHI Conference on Human Factors in Computing Systems (CHI ‘14). ACM, New York, NY, USA, 1807–1816.